Michael Blatt, Regius Professor of Botany at the University of Glasgow and Editor-in-Chief of the journal Plant Physiology, is back into the arena, fighting against the anonymity in post-publication peer review (PPPR). I have been in regular email exchange with Blatt, as indicated in my earlier blog post about the advantages of signed PPPR. Now the British scientist has published another editorial in his journal, titled: “When Is Science ‘Ultimately Unreliable’?”, where he addresses the arguments usually brought up in support of anonymity in PPPR. In his earlier editorial in October 2015, named “Vigilante Science”, Blatt has exposed himself to plenty of criticism, including from my side, and it seems most of it happened due to a misunderstanding. “Anonymity is not the answer, however, not if due process is to ensure civil society and protect the innocent from denouncement or worse”. As journalist, I agree. Though I always take care to protect my sources when they do not wish to be named, I certainly prefer knowing who these sources are, for a number of good reasons. Yet I also occasionally take hints from those whose identity or association I do not know at all, it really depends on the nature of information they share. “Questioning data and ideas is the norm in science. Unless you are making an allegation of misconduct (and we’ve set this aside for the moment), it is possible, even as a Ph.D. student or postdoctoral researcher, to question a senior scientist openly, nonanonymously, in a way that is constructive and nonthreatening”. For Blatt, the latter is “not an argument for anonymity per se”, instead he fears that where scientific discussion is intended, “anonymous commenting quickly escalates de facto into trial by kangaroo court”. As the botany professor sees it, every scientific discussion is beneficial for science, if it is led in the open. He is convinced that most researchers will eagerly engage in challenging discussions and appreciate constructive critiques. In fact, though Blatt may not be aware of this, there is plenty of evidence even on PubPeer of authors responding to criticisms, even to those placed anonymously and concerning data integrity. Yet, many authors do not reply at all, and some scientists do indeed engage in “abuse, sock-puppetry, and other nefarious and conﬂicted behaviours” (please see my example of Jacob Hanna anonymously trolling a former colleague and current competitor). Blatt acknowledges that there are scientists “whose minds are closed”, but also suggests that “such individuals are not worth the trouble in any case”. Indeed, if you sign your paper critique, certain senior figures in science are bound to feel provoked and even turn aggressive. In my view though, this kind of behaviour would give junior researchers a useful early warning on which potential mentors and collaborators to avoid in their career. One can only hope that Blatt is right in assuming that such close-minded scientists are indeed a minority. “Science requires substantial training; its foundations are logic and reasoning; it builds on the merits of knowledge and expertise; it is not a ‘one man, one vote’ endeavour with universal enfranchisement”. Of course, if the critique of a paper was always presented in a formal, scientific manner with objective, disinterested language and the absence of any type of hidden agenda then I’d agree – only the message counts. But that’s simply not what happens in the majority of cases. A cursory glance through many PubPeer threads clearly indicates that the language is often far from objective and disinterested. Context is everything. And, as Mike Blatt said in his original post, anonymous critique wrong-foots the scientist who is being criticised right from the start. […] If we going to criticise someone else in public, we should have the decency and intellectual courage to do it without hiding behind anonymity”. As I see it, both Blatt and Moriarty have a certain point here. In an academic debate, all these years of acquired knowledge and research experience in a specific field do account for something. I am quite sure none of the above implies that a professor is always right when debating an undergraduate student. A polite open discussion between these two however can only benefit from being led non-anonymously: the student will strive to formulate the criticisms with more thought and consideration, while the professor will be more careful before embarrassing him- or herself in an open public forum, and hopefully avoid dismissing valid criticisms with pompous, clever-sounding, but vacuous arguments (a scenario quite common to many privately-led academic discussions). “Knowing who enters into a debate does matter, if only because the most appropriate response almost always demands some knowledge of the context and the background of the questioner”. There is even a degree of agreement between Blatt and scientists who themselves actively engage in anonymous whistleblowing. Below, two US researchers express their support for the idea that PPPR as scientific discourse should be led in the open, while remaining adamant about the need for whistleblower’s anonymity where potential misconduct is suspected. Finally, yes, as a woman I feel more often criticized or undervalued than men are. Women often receive very personal and harsh feedback, criticizing their emotions or appearance rather than their work accomplishments. When I post anonymously, I remove that risk. People then can only respond to what I had to say, not to who I am or how I look like”. “I have not done a lot of journal-club PPPR […], but those I will usually do under my full name. […] Those posts are mainly trying to point out new papers and I might mention some weaknesses, but the tone of those reviews (I hope!) is usually overall positive. Those I have no trouble with writing about under my full name”. It took me a lot of years to gain enough confidence to write so critically about a paper, but with this particular one I felt strongly that someone needed to say something, and I felt that my background knowledge was sufficient to give feedback on this paper. I was a bit worried that I would get negative responses myself, but I have not heard anything after writing it”. “I would say if it’s PPPR in the broader definition (i.e. journal-club like discussions, of the type PubPeer was originally set up for) then probably there’s less need for anonymity, since there’s not a lot of malice in simply asking another scientist to clarify a point, or expressing an opinion about a paper. I’ve done this a bit on PubPeer using my real name and the response from authors has been good. Here’s one example. However, when specifically flagging problem data (i.e. what PubPeer has largely become) there’s an absolute need for anonymity because there’s often (not always) the inherent implication that something was done wrongly. Even if it was a simple mistake, people can sometimes react very differently when their mistakes are pointed out in public, often with a backlash against the accuser (think Jingmai O’Connor). Thus, anonymity is the safe choice in the current climate where we all decide each others’ fates”. “I was approached by the editors of RetractionWatch, which also accepts anonymous comments, and wrote a guest post, but the RetractionWatch editors subsequently stepped back from the debate, choosing not to publish the post”. “While Mike was very generous with his time, and worked with us on a few revisions, we reached a point where we did not find his arguments against anonymous comments compelling enough for a guest post. We did not agree on whether the evidence he provided supported his case”. “True, it may be argued that the article should never have passed the review process. The study was shown to be ﬂawed technically, and the conclusion of arsenic-based life was subsequently discounted, in part because the authors did not take account of low levels of phosphate impurities. However, there is nothing fraudulent about the data per se. Furthermore, far from ignoring the concerns of the community, Science stepped up to the debate to facilitate community awareness. Back-to-back with the article, the journal published seven critiques of the work, the authors’ rebuttal, and a note from Editor-in-Chief Bruce Alberts in June 2011. The Science article proved ‘ultimately unreliable’ only in the hyperbole of its interpretation. It stimulated research leading to important insights about a transporter that scavenges phosphate in the presence of exceptionally high levels of the structurally similar arsenate anion (Elias et al., 2012; Erb et al., 2012; Reaves et al., 2012)”. Indeed, it would be interesting to see the peer review history of this Arsenic Life paper, or to find out why the certain basic controls were never performed (or, who knows, even deliberately dismissed) by its NASA authors. This information might by itself make a retraction necessary. Yet, also a purely artefactual paper may still have its use (provided of course, the honest mistake was indeed honest, and corrected): simply because the artefact it erroneously described was a real phenomenon, possibly worth studying in itself. This makes such papers different from the true zombie papers, which, though since long exposed as suspicious, manipulated or even fraudulent, still freely roam the scientific literature, wreck damage and infect the brains of their heedless and unaware readers. “Science does not end with publication. Publication is only the beginning of scientiﬁc debate. Progress often arises from what, in hindsight, is ‘ultimately unreliable,’ and its cornerstone is open debate”. Update 4.4.2016: there was some interesting discussion between Michael Blatt and PubPeer managers Boris Barbour and Brendon Stell, led also publicly on PubMed Commons. Some of their email exchange has also been made public, with interspersed comments by PubPeer. The issue was a disagreement about if and how PubPeer’s reply to Blatt’s editorial should be published in Plant Physiology. Displeased with what PubPeer perceived as Blatt’s unjust restrictions (text length, topics, moderation, delayed publication in the journal or rapid publication in ASPB blog instead of journal’s homepage, etc), they withdraw their offer to debate. Thank you, Dr. Schneider for this new analysis. The timing is precious. Over the past few months, I have been engaged in an extremely civil and polite discussion with Prof. Blatt about the anonymous voice in PPPR. We have not agreed on some core issues, but we have still had a unique opportunity to interact civilly. Our entire interaction was quite unique because we were under constant moderation by a Plant Physiology professor at John Inne’s Center, and one more moderator. Very strict guidelines were set down about how our discussion would take place which would ultimately lead to a 500 word statement made by each party. In essence, the rebuttal letters to each round of edits had, in some cases, several thousand words, but we were limited by our established guidelines. After we reached what we felt was our final statement on the issue of anonymity, the paper was sent to three peers who had the choice of being named, or not. Even though the peers did not always agree with the opinions either Prof. Blatt or I had made, they were all adamant: the discussion needed to be published. I estimate that there may have been close to 20 versions of this discussion. Teixeira da Silva, J.A., Dobránszki, J. (2015) The role of the anonymous voice in post-publication peer review versus traditional peer review. KOME 3(2): 90-94. I understand that there is considerable anti-Blatt sentiment out there. But how many are thinking consciously about the issues and actually trying to do something to defend the accuracy and integrity of the literature as Prof. Blatt and Plant Physiology are? You need only look at the evolution of errata, corrigenda and retractions in the past year at Plant Physiology to understand that the attitude is not passive. I believe that those attacking Blatt may have a different agenda on their minds. My personal experience with Prof. Blatt – despite our sometimes very acute differences of opinion – is that this is someone the plant science community needs. I don’t think it’s easy being the EIC of a leading journal nowadays because the public is ruthless at times and because near-perfection is expected. I guess this is the price people and journals pay for being at the top. I was one of the first to be critical of Prof. Blatt’s original “Vigilante Science” editorial piece. Many thanks, Leonid, for this thoughtful assessment. Likewise, Jaime, I appreciate your comments and look forward to the publication of our discussion next month. Indeed, as Philip notes, the debate rumbles on. I don’t expect a sea change as a result, but for sure airing these issues will be useful for community as a whole. Hopefully it will change the way that some think about the use of public fora and communication by social media. Almost every point Dr. Blatt raises also argues in favor of eliminating anonymous peer-review of manuscripts during the publication process. In my experience, many journals ban critical comments by readers (though signed and editorially approved) to the most invisible part of their on-line article editions. Furthermore, to my knowledge, most journals do not have discussion-encouraging policies (e.g. they could invite other experts for extending the discussion) and readily accept authors not responding at all. I would like to know Professor Blatt’s stand on this, since as an editor-in-chief it is here where his appreciation of the open scientific debate could really make a difference. Johannes, I am not sure that your characterization is accurate. When you say “ban”, I think what you mean is that there is no structure in place to accommodate post-publication comments or critique. I think no journal specifically bans commentary. The second criticism I have of your statement is the claim that “most journals do not have discussion-encouraging policies.” In a formal sense, you may be correct, i.e., during peer review, it is only the opinion of a highly limited number of individuals that determines the fate of a manuscript (i.e,, published or rejected status) while the vast majority are excluded. However, most journals and editors are open to post-publication critique. In some cases, this can exist in the form of letters to the editor, or even more formal complaints if more serious issues are discovered such as data manipulation, duplication, or plagiarism. So, I would agree that a very crude PPPR structure is in place, but it needs to be expanded. It needs an open commentary forum, but then who will monitor that? Editors are already so stressed out and stretched thin that few will agree to also moderate an online discussion forum. I do agree that one is essential, but the management issue is going to be the limiting factor. That is why independent sites/blogs like PubPeer and Retraction Watch emerged and grew in strength, because they identified gaps in the system that did not allow for post-pub critique. I wish to defend Prof. Blatt for a second. I have seen a fairly harsh and blunt criticism of Blatt regarding his first and second editorials, and indeed, I agree that he needs to recognize the importance of the anonymous voice, because this is simply an inherent right of any individual, i.e., to mask their identity, when making a criticism, especially in a status quo-controlled area such as science and science publishing. So, in that sense, I have my own disagreements with Prof. Blatt. I also think that if he wants to write a public editorial defending his position, then he is going to get hammered by the anti-establishment crown. That almost goes without saying. However, as a plant scientist, I feel that the quality of papers at Plant Physiology is truly excellent. No doubt that some bad apples get past, and that near perfection is most likely never possible, but Prof. Blatt has already clearly indicated that there are channels available for discontent readers to vent their concerns with papers published in Plant Physiology. I also believe, although I don’t think Blatt would support this stance publicly, that if real concerns were raised publicly and anonymously, e.g., at PubPeer, that he and Plant Physiology would actually consider them, although maybe not “officially”. Think about the basic logic of it: if a serious accusation or error were made about a serious issue in a paper published in Plant Physiology, and if that claim was made anonymously, as on PubPeer, for example, do you honestly think that Blatt or Plant Physiology would ignore it? I don’t think so. They would simply prefer, from what I can tell, that such criticisms be made formally through more formal channels. I can appreciate the need for such a rigorous society to avid the pitch-forks in academic processes. But these are tough new times in science publishing where vigilantism may certainly have to be a new part (acceptable or not) of science publishing, if not only to hold “guilt” parties accountable. Finally, Johannes, I think that it would be useful if all publishers had some mechanism in place that would allow comments (anonymous or not) to be linked to articles, such as occurs on SpringerLink. If you go to any paper on SpringerLink that has comments on PubPeer, these appear under the citations, allowing the scientific community to examine these comments before accessing and reading that paper. But why do papers on Elsevier’s sciencedirect.com, Wiley’s Online and Taylor & Francis online portals not allow linking to PubPeer and/or PubMed Commons? I think this is an issue that needs more attention, rather than ragging an EIC of one of plant science’s premier journals that is, in my opinion, doing as excellent a job as possible, in enforcing the integrity of the published record. If all plant science journals were as careful and as conscientious as Plant Physiology, and if the EICs of plant science journals published by Springer-Nature, Elsevier Inc., Wiley-Blackwell and Taylor & Francis were as interactive as Blatt, then we wouldn’t have as many problems as we do. It is precisely because Blatt had the courage to state his case and expand the discussion in plant science that he deserves some credit, not just a mad bashing as I have observed in recent days by the largely cynical anti-science crowd. Jaime, do you have examples of how the journal Plant Physiology deals with critical comments on published articles? I am not so much against what he writes, since I also prefer non-anonymous discussion, but I feel his writing is naive in the sense that he seems to believe that if one uses one’s own name most journals and authors are up for an honest and visible discussion. That clearly is not the case. I know that there are differences between journals in this matter, but I have no experience with the plant field. We do not (or should not) rely on the literature uncritically; science progresses by challenging previously “established” assumptions. We do not (or should not) judge arguments based on the number of awards the arguer has received. We judge (or should judge) an argument on its merits, e.g. on its logical consistency, on its consistency with the facts as we know them, or on the rationality of its reinterpretation of these facts. If we don’t feel we are in a position to responsibly and effectively evaluate an argument, we don’t cut corners or play it safe by banning voices who aren’t part of the establishment or don’t feel safe challenging the establishment. The substance of a critique is not affected by style of presentation. Debates can get heated, and I don’t understand this demand for tea party etiquette and “disinterested” language. Such factors are highly subjective and there is arguably a heightened sensitivity to “tone” in the case of threats to one’s own or close colleagues’ ideas. With respect to the fear of a “hidden agenda,” who decides that this is the case? Should a critique from a “rival” be dismissed as not “disinterested” enough? No, we’re back to the responsibility to evaluate arguments on their merits. I’m impressed that P.M. could, with a “cursory glance,” conclude that in the majority of cases the “language” of PubPeer posts is “far from objective and disinterested.” Perhaps he could cast a second cursory glance to estimate the proportion of the arguments (as opposed to the language) that are not objective (please leave out the disinterested category. I’m generally very interested in my preferred ideas and arguments). PubPeer removed the word “psycho” after I reported it, but otherwise let the comment stand, presumably as valuable contribution to the discussion on the paper by Maria Pia Cosma. In an email exchange with me, Brendon Stell himself announced to “take a look”, obviously, he saw the comment as not problematic at all. And there was more. In short, anonymity (especially the total one by unregistered submissions) allows people to drop all pretence at civility and lash out at each other as they please. I am not sure how any reasonable discussion can be led there. The paragraph starting with “Of course…” should be in quotation marks. That indicates to me that there is an active process of correcting the literature in this journal. More importantly, the issue of correcting the literature appears to be done seriously, promptly, and professionally. So, in an absolute sense, despite whatever indigestible things Blatt may state in his editorials that do not go down well with the PubPeer crowd, the reality on the ground at Plant Physiology reflects a serious concern with issues in their literature. I wish I could say the same about many plant science journals published by Springer (I think has the worst track record and the most unprofessional editors in chief). Once again, I think things need to be seen in a relative context to appreciate how good things are at Plant Physiology (vs for example, at Springer). There is also alot of incompetence and editorial arrogance among Elsevier plant science journals, and also some issues with Taylor & Francis journals. OUP and Wiley journals related to plant science seem to have a tighter grip on things, but once again, no telling how anonymous comments are handled. I did notice today, while browsing some case studies, that some Elsevier journal articles now appear to be linked to Altmetrics and PubPeer comments, so this seems to be a new and positive development for PPPR, at least for plant science, because now we can step over the editorial firewall that has been trying to smokescreen queries and complaints. Disclaimer: I have no papers in Plant Physiology, and the only link I have with Blatt is an upcoming discussion-type editorial where I argue in favor of anonymity and Blatt counters my arguments. I suspect that that 1000 word editorial is also going to cause somewhat of a firestorm. Jaime, I don’t know if the list of one retraction (because of self-plagiarism) and three corrections is impressive. Most journals nowadays have no hesitation to place corrections. Where they differ is in how willing they are to retract non-trustworthy papers, and whether they allow a serious and visible discussion on-site connected to the respective article. Do you know whether Plant Physiology provides the opportunity to place critical comments, and whether they make those comments clearly visible? My point is that PPPR is necessary, and that most journals do not provide good opportunities for it, and that therefore an editor-in-chief therefore shouldn’t be critical about how modern PPPR takes shape unless he provides thoughts on a valid alternative. After all, if not editors-in-chief, who else can organize a valuable platform for non-anonymous PPPR? Johannes, you are now asking questions that I am unable to answer. Only Prof. Blatt and PP would be able to respond. I hope that Mike would engage with the public to respond to these specific questions. I feel, once again, that more than most plant science journals, that PP has a pretty rigorous system in place and that the editorial structure is receptive to criticism, simply not to anonymous critiques. I fully agree with you that a PPPR platform is lacking for most journals, and that is why the rather aggressive attacks on Blatt are somewhat unfair, because what is lacking at PP, in terms of a suitable platform to deal with “open commentary” about papers is a weakness that characterizes most plant science journals. At the top of my head, I only see journals like Frontiers in Plant Science and the PLOS journals with a rustic platform that can accommodate for feedback and comments on papers, although commentators have to be registered, similar to PubMed Commons or “Peers” in PubPeer. I am not aware of any totally freely “commentable” plant science journal, i.e., at the post-publication stage. If Blatt or any other plant scientist is aware of any plant science journal that has such a platform, please inform us, because then we could use this as a basis for building something that could be suggested to all other journals. Elisabeth Bik sums up, from a personal perspective, much of the key argument that Michael Blatt singularly fails to grasp. My reaction to his editorial is that he is being defensive, because he is uncomfortable with full transparency. The world isn’t equal, it is obvious that some in power abuse it and there is no transparency. The track record of many traditional journals in dealing with reader queries is usually a laughable charade of negation, secrecy and if the tide of opinion becomes too strong, minimal action. There are notable exceptions and these deal with queries from readers, be they direct or via PubPeer, efficiently and openly. Your cartoon is also apposite, Open Data is changing things, though the humber of papers in biomedical science published with all data available is still tiny. Ferniglab, the way you speak about Blatt is almost as if he is guilty of the things you list. c) that the track record of Plant Physiology is a “laughable charade of negation, secrecy and if the tide of opinion becomes too strong, minimal action”. Your characterization does not match the Mike Blatt that I have had to interact with. I do feel that he may be defensive, but only because Plant Physiology is, from what I can perceive, a society journal with a financial complement to it, so one would expect the leadership to be defensive against public attacks. Do you understand why the attacks on Blatt seem somewhat disproportional and excessive? Jaime, beyond plant science, I fully agree with your sentence “If Blatt or any other plant scientist is aware of any plant science journal that has such a platform, please inform us, because then we could use this as a basis for building something that could be suggested to all other journals.” I don’t mind and even prefer monitoring to some extent by the journal editors to screen for politeness and some level of scientific soundness, and maybe even at some point stop the discussion if points are starting to get repeated. But in the current situation I have left comments at articles in Science, Cell and Immunity, all of which were (rightly so) screened by the editorial team, but which were placed at a (presumably so intended) totally invisible spot of the on-line article. For two of the three articles the authors did not respond. My point is that editors-in-chief should try to help create useful platforms for PPPR, rather than only criticize the PPPR forms that emerged because of their unwillingness to properly deal with reader’s comments. More in general, we should be pointing less at each other and try to do our own bits and try to develop a better system together. I think that actually we are moving in the right direction, in part because in most people working in science, beneath all the decisions driven by economy, there is also a true love for the profession. Although I am not a big fan of anonymous PPPR, I do think that it is the biggest driver of the current climate of improvement. Johannes, I fully agree with you. The current publishing system is insufficient. I have been trying to persuade plant scientists of the essential nature of PPPR for plant science for years now, but my message is not getting through, even despite contacting tens of thousands of plant scientists directly. Unfortunately, there is far too much resistance to the idea that open discussion at a post-publication phase is essential. There continues to be this elitist, arrogant notion that the EIC and editor’s word and decision is the be-all and end-all of the publishing process. Look, at a practical level, I can appreciate that an editor, journal, or publisher don’t want to be challenged after a paper is published, but science should not be about egos and self-serving selfishness. It has to be about the accuracy of the information that is published. On some days, I feel that it is a losing battle. I consider myself to be in the middle-class of plant scientists, and I know what I’m talking about when I speak about several topics in plant science. So, isn’t it my disgust when two editors-in-chief of leading Springer plant science and biotechnology journals fail to issue even a single erratum when I expose two papers with dozens of errors? And when Springer executives are copied on those emails, they sit by idly. For one simple reason. When it comes to profit, they will use the excuse of “editorial independence” to defend their position. And when it comes to creating a PPPR-friendly platform, they will argue that they have no budget for it, and that there is no need for it because their peer review systems are “robust”. So, we have this circus-like state of affairs in science publishing where current errata and retractions are simply taking place (apparently) at a faster pace, simply because the business model that has “ethics” as one pillar, needs to show that the publishers are doing something. But it’s still a superficial charade. The self-protectionist attitude of EICs and the editorial status quo is, in plain English, disgusting. And the publishers are also responsible for this because they are failing to provide a flexible structure that can accommodate for “change”. It’s going to be a long and painful battle. Can you imagine what will happen when I begin to expose the editorial corruption at a massive scale in Springer plant science journals? I will be banned, just as I was banned from Elsevier’s Scientia Horticulturae, or from Taylor & Francis journals, for exposing the truth. But someone has to show the truth. Someone has to take that bold first step. I am willing to risk it all to show how the entire community has been seriously hood-winked by these EICs and by this publisher. Sometimes, for there to be change and justice in a system, there has to be an act of radical behaviour and demonstration. As I see it, provided that there is a self-protecting system of the status quo, there is a serious need for social/scientific rebellion, even if it implies vigilantism. If the status quo does not want to change, or reform what is clearly a corrupted and weak/flawed system, then pressure must be applied somehow. And that is what I am doing in plant science. I am raking in the enemies quite exponentially, but this is an essential requirement to force accountability when accountability is not forthcoming. We have to put EICs and publishers in the hot spot, for example the Sauren Das and Mohamad Anis retractions that were supposed to be published 6-8 months ago in Springer journals, but which were not. It implies that we have to challenge COPE, that offers a pseudo-ethical protection to its paying members (clients?) even if the ethical elite structures are deeply invested in expanding COPE membership and enforcing their ways. So, in some ways, one has to ask why is it that with so many (potentially) tens of millions of plant scientists, that so few are speaking out against this wide-scale “corruption” in plant science publishing? Now, does Blatt fall into the traditional category of resistant status quo when it comes to not embracing an open-minded, open discussion PPPR as part of the publishing model? I believe yes, but this could also be a function of his educational background and even age (seniority). I respect that. But I also think he may be tied down by legal issues and parameters that may be associated with the American Society of Plant Biologists. These are issues and decisions that we will never know about, but which are not beyond change, I believe. Ultimately, only Blatt can offer insight into/about Blatt. If we could somehow show the benefits of a literature-wide platform for PPPR, then we may actually be able to convince the current editorial elite and publishers to enact reform to accommodate for an open peer review system with continuous commentary. I am actually surprised because I would have expected our younger Twitter / FB / etc. generation to be pro-active and more gutsy when it comes to challenging the establishment and speaking out their ideas and criticisms openly, but seems like politically correct education and moderated tone has come to dominate the system. We have been brain-washed into thinking that challenging the system and the status quo is a bad thing, we have created an education system that attaches a stigma to rebellion and to fair criticism, and a publishing system that views open criticism as almost an act of whistle-blowing against the establishment. So, so few speak out, even when they feel that things are wrong. There is one tool right now to help concerned scientists: PubPeer. So why have more not used it? I claim that it is because they feel that it brings them no self-serving benefit. Again, the issue of a selfish community that will only work towards its own interests. I have at least once told Blatt that what we need is to unite our voices in defense of the need to have an open system of PPPR that allows post-pub critique. I understand Blatt’s territorial defense of Plant Physiology, but Plant Physiology is not one of the cancers of the plant science literature. Despite what many criticize in Blatt’s two editorials, at the end of the day, he has served the plant science community well (as best as anyone can) and has held the level of quality of work published in his journal to a high level. He MUST be praised for this effort and for this achievement. I think the public is free to be critical of certain sound-bites from his editorials, but they should also give him, to be fair, due recognition for his ability to defend quality and integrity in his journal. So, how do we ask an EIC who is also a full time academic at an academic institution to give more of himself to defend the integrity of the wider plant science literature. How do I convince Blatt that the issue is not with Plant Physiology, but instead with Springer’s plant science journals, with Springer’s plant science books, with the International Society for Horticultural Science’s Acta Horticulturae and the quasi-maffiosa style elite that has crept into leading horticultural journals in the Elsevier and Taylor & Francis fleets? How does one deal with a cancerous situation that has in essence taken over the main organs of the plant science system? It is evident that Blatt would never align with a new ideology to rote out this editorially corrupt elite. 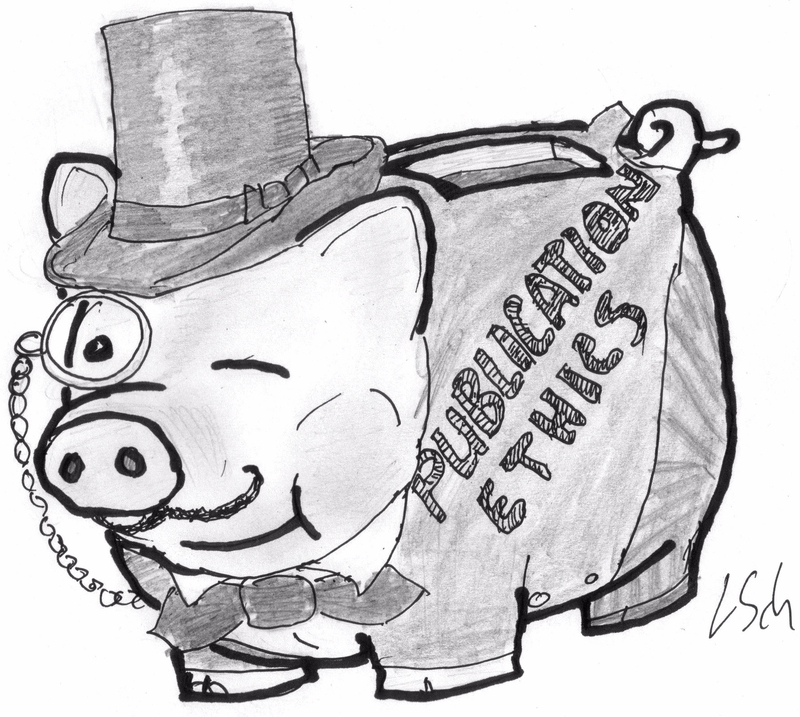 However, in recent weeks, as publishers increasingly use “ethics” as one part of their business model, to give “value added benefit” to fortify the stake by share-holders, and thereby ensure profits, the pressures on them to correct the literature is increasing. A comment at PubPeer + an email to a handful of select individuals is enough to get the ball rolling now. More and more, scientists, editors and publishers are somewhat fearing being exposed publicly because a couple of rough comments on PubPeer and the exposure of errors that were not dealt with quickly, or effectively, will sting their business model. I am now working on roughly 400 cases in plant science, and in the past 2 weeks, I decided to take the bull by the horns, without anonymity, and ask the authors, editors and publishers why queries that have been in the public domain, primarily at PubPeer, have not yet been addressed. The response has been quite fascinating. After I have compiled the stats, I will report. But what I want to say is that in time there will have to eventually have to be a PPPR system that takes into account the public’s comments and criticisms and only those journals that have a platform that allows for moderated (incl. anonymous) comments, will come to dominate the publishing kingdom. Or be relegated to the same rank as the disgraceful predatory open access publishers. Jaime, good luck with that enormous project. I agree with the word “charade” you use for how some journals address publication ethics. For example, Professor Blatt is mentioning a case of an article in Science where Science featured an extensive PPPR discussion to show how “the self-cleaning part of the system works quite well”, while he does not seem to realize that Science strongly selects these discussions from a large number of critical comments based on a number of considerations among which their public image probably is a major one. Although I didn’t check the details of that case yet, I probably wouldn’t mind if his Science example would become the gold standard for PPPR. But such high quality PPPR should be done for all comments with sufficient scientific weight, and not only for those comments that the journal deems politically safe or unavoidable. If that takes extra man-power, so be it, now we lose enormous amounts of money on wasted reading time and on experiments inspired by flawed articles. I am an (unpaid) member of editorial boards and review for several journals, and don’t see why scientists would be willing to do that but not to engage in or monitor a civil discussion about the papers in “their” journal. We are a strange business where the form and quality of the final and often only output of expensive research, namely the publications, are decided by economical factors (at the site of the journals) which are very small compared to the total costs of the respective research. If a fully capitalistic journal model does not allow for high quality PPPR, though we all degree that it is desirable, possibly governments or foundations can provide the important journals with the necessary financial means. I think that would be money well spent. I am not pessimistic, I can see that things are changing, and all open discussion probably contributes to that. For that Professor Blatt should be applauded. The informal discussion between Blatt and I is now published. In that discussion, the descriptions by Professor Blatt of his policies in regard to stimulating (non-anonymous) PPPR in his journal sound very good to me. If such policies are in place indeed, he has every right to criticize the fact that too much of the modern criticism in science is anonymous. I keep finding him naive where he generalizes the discussion beyond his own journal, but overall his contribution to the discussion on how PPPR should occur appears to be genuine and is constructive. Johannes, just yesterday, Mike and I had a chat, and I told him that now that the discussion was over, I agreed with him that there are some aspects of anonymity that can be unreliable, or worrisome. Other than that, I also told him that his journal and his leadership role in the plant science community is essential, because what he has done for Plant Physiology is something quite astonishing. If only most mainstream commercial publishers like Taylor & Francis, Elsevier and Springer-Nature could produce journals as strictly peer reviewed, and tightly controlled, as Plant Physiology, then plant science literature wouldn’t be in the mess that it’s in. His views about PPPR are pretty much interpreted to be a positive thing by both sides of the anonymous debate. Remember, Johannes, PPPR is not being debated, simply the mask that is used to expose PPPR’s results. So, Mike’s lauding of PPPR is somewhat of a distraction to the core topic: is anonymity essential, or not, in PPPR, and in science publishing overall? One need only go to PubPeer on any given day, and open up the top 10 entries and read the comments. Except for comments that are imported automatically from PubMed Commons, almost all of them will be signed as “Unregistered Submission”, or “Peer X”. This means that almost all comments are anonymous, i.e., in the broad sense of the word: the public and readers do not know their identity offhand. This is what my criticism of Blatt is at base, and which fueled our discussion: the denial that these comments are not valid, simply because they do not have a name associated with them, is not realistic. It ignores that those who comment anonymously do so for so many reasons, and many of those reasons are valid (privacy, fear of repercussions or reprisals, either from peers or from supervisors, etc.). Provided that there is still the element of fear and negative stigma associated with being critical of others’ papers in public, provided that there is that element of shame associated with those who offer valid queries, concerns, or criticisms, then it is obvious that anonymity will thrive. The minute that you have anonymity built into the publishing model, as well as PPPR, then we might see things differently. But with basically only one real PPPR site in hand (PubPeer), science is still far from achieving anything resembling full transparency and accountability. I think the discussion on anonymity is pretty dead right now. Now we need action, and we need solution. Action implies PPPR. The more “we the people” and “we the scientists” prove that there are problems with the literature, through examples at PubPeer, the more we prove that authors fail to provide copies of their literature, that authors fail to respond fully to concerns, and the more than we prove that there is indeed this great editorial firewall in place in most journals, the more reason is given for PPPR to be anonymous. In the past three months, 50% of my reports, which are signed by me, have been evaded. In these cases, neither the authors nor the editors have responded. So, this should show to Mike that there is resistance, active resistance, to PPPR, in the real world of plant science publishing, that lies outside of his Plant Physiology castle. And in these cases, I am talking specifically about COPE member journals, whose editors are expected to respond to queries, including anonymous queries, within a reasonable space of time (i.e., within a handful of days). Unliek Pubpeer, PubMed Commons does not allow anonymous commenting. Perhaps that is why people more often comment in PubPeer….